It's been a while since I've posted something on my blog. Been so buzzy with lots of things. Moved in with my Animal, had to fix a lot of things for the house, looked for an other job. I failed the last Dailystills. So time for a brand new Dailystills. May is here so more sunny days (I hope) Lots of outside trips and perfect times for cute pictures! Who is joining this month? Are you joining us in May? Let us know on Instagram :) My IG account: @shanimal_ and Mandy's: @daintydreamblog. You're allowed to save this photo and share it on Instagram too, enjoy! 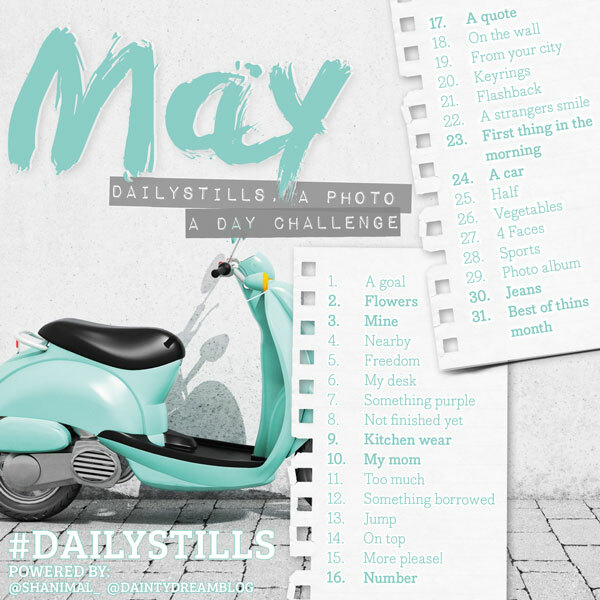 ♥ Take a photo using the prompt as inspiration. So for April the prompt for day 1 is ‘A goal'. So take a photo with goal you take, going to workout more? Take a before picture or your inspiration. Joining a contest? Take a picture when you are finished. Anything thats a goal for you, take a nice picture and share it!